Examples include people trying to renew their passport or driving licence, book a driving test or apply for a European Health Insurance Card via the NHS. Example of a legitimate advert above Google’s search results. If you feel misled by an advert, Google has a simple form to let you report your concerns. Many people complain that they felt these third-party websites did not provide of any value over and above the service already available on the official service, accessed via GOV.UK. Some of those complaining felt misled into thinking such 3rd party websites were actually the official, government-run service. The vast majority of people end up on such websites after clicking on an advert appearing above the normal search results on Google, Bing or Yahoo. If you feel misled by such an advert, Google now has a simple form to let you report your concerns. We have been working with Google, by far the largest search engine in the UK, to tackle this aspect of the problem. Over the past few days, Google has stopped selling adverts to some of the websites which have been the cause of many complaints. But Google remains very keen to hear from people who feel misled after clicking on such adverts appearing above their search results. This will help them remove such adverts as quickly as possible. We would encourage people to complain to Google if they feel aggrieved, since this may prove the swiftest and most effective way to fix this problem. You can also report concerns about potentially misleading adverts appearing above Bing and Yahoo! search results. On a related note, if you’re concerned about phishing emails, or other Internet scams, visit this page on GOV.UK. Earlier this month I dug into the analytics data to better understand what devices people are using when visiting GOV.UK. I thought I’d also quickly share headline data on what browsers, operating systems and screen resolutions we’ve seen over the past month across the whole site. I hope it’s useful. We’ll publish more detailed browser version breakdown data soon, though I can’t resist sharing that Microsoft IE6 usage seems to have halved to 0.4% from 0.8% over the past 12 months. Note: this browser data combines both desktop and mobile versions. Again, the story here is the rapid rise of “portrait” smartphone screen resolutions such as 768×1024 at the expense of traditional “landscape” desktop resolutions. 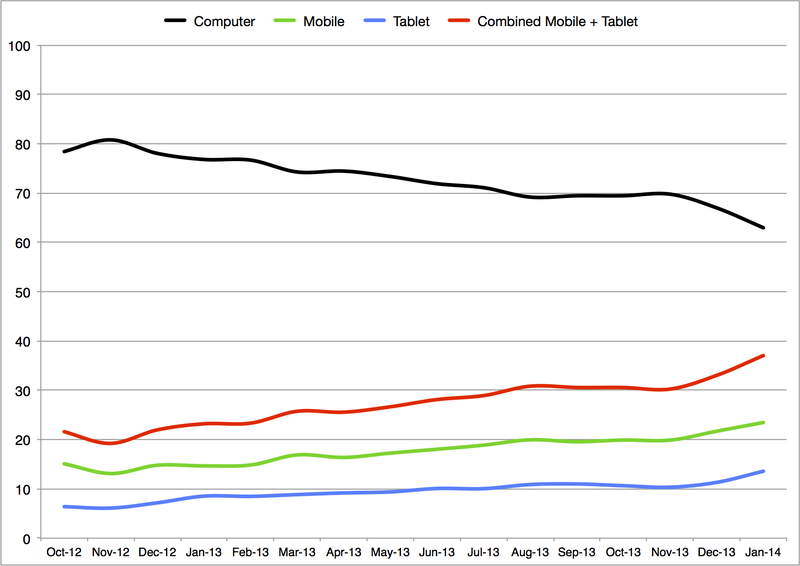 Further evidence of the rapid shift to a wider variety of screen sizes as mobile device use takes off.